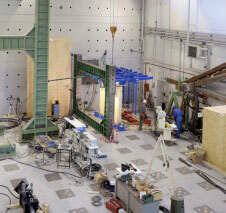 Experimental testing of the HMSDC group is conducted at the Laboratory for Material and Structural Testing (LPMS) of the Department of Civil, Mechanical and Environmental Engineering (DICAM) of the University of Trento. It is an ISO certified laboratory that carries out both internal and external experimental research activities. LPMS (see Fig. 1 and Fig. 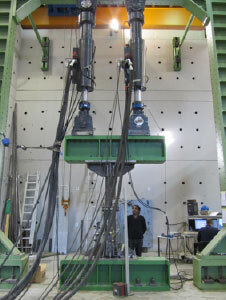 2) is specifically designed to carry out various types of tests -both static and dynamic- involving heavy specimens (up to 200 kN) and high level of loads (2000 kN and more, depending on the set-up). It is equipped with highly standard equipment, such as MTS actuators and controller, for conducting modern testing like pseudo-dynamic and real time tests. The main instrumentation comprises universal testing machines of capacity 10 and 100 tons; four MTS and MOOG electro-hydraulic actuators with capacity 100 tons and stroke 500 mm and one of capacity 50 tons and stroke 1000 mm, four of which with a dynamic response; control systems for the actuators; several devices of data acquisitions, with high frequencies capabilities; cameras at high frequencies of image acquisition. Moreover, there’re workshops for steel and wood manufacturing. LPMS activities mainly focus on the organization and execution of complex tests carried out both into the Lab and in situ. Subject of interest are the mechanical behaviour of structures and structural elements, building materials, composite materials, the dynamic behaviour and earthquake resistance of structures, in-situ monitoring. The interest is extended to civil and industrial constructions and to infrastructure systems. Figure 2. 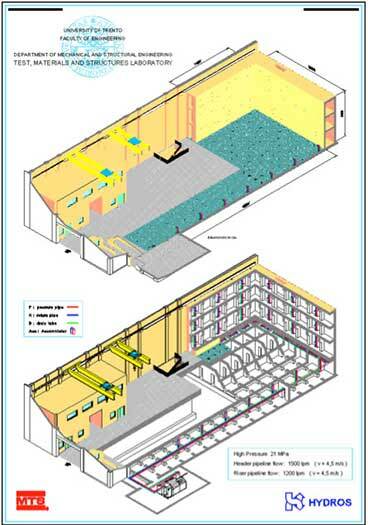 3D sketches of the Laboratory and the high pressure oil pipeline network.